Not only that, it sounds like EarthBound is now ranked 9th on the North American Wii U eShop’s all-time best-selling list (whew that’s a mouthful)! Here’s hoping EarthBound keeps doing consistently well! In Europe EarthBound is now ranked 8th on the all-time best-selling list. Nice to see that EarthBound is doing so very well in the USA and Europe. It’s only been like a month and it’s already so high on the list! I wonder if Nintendo has made up fro Earthbound’s so called flop when it was first released. I mean 200,000 copies x $9.99 each = $1,998,000. Thats just my estimate of how much it probably sold. I wish I could buy more copies or gift it to other Wii U users. i second that ryan, i dont have a wiiu yet, but if i did i would buy it in a heartbeat, i do have a 3ds though… but i think the real question is, with the new virtual consol success of earthbound, will they try to see how mother 3 will fare? I hate to say it, but top ten isn’t a huge achievement on Wii U eShop, considering there’s not enough games on there period. That’s not to say it’s meaningless, because it definitely is not, but it’s not nearly the same as on another, larger service. It’s only been a month. Let’s see where it is in 6 months. I’m so glad that so many people are buying it because it means that so many more people are getting to enjoy it when they might not have had the chance to before. 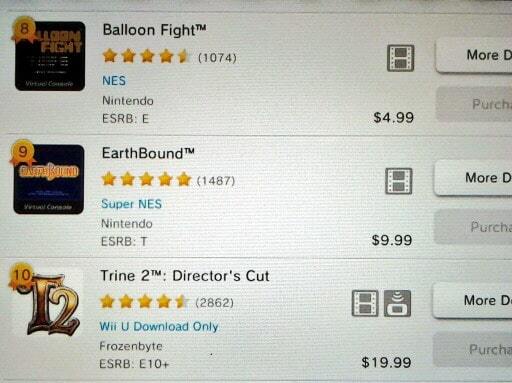 Earthbound is also NOA’s best selling Wii U e shop title that was not for 30¢ at one point. @Silverbolt202: Actually, it isn’t. If you were to remove all 7 of the games that were 30 cents at one point, it would be in second place behind Super Mario World. Guys, EarthBound on 3DS is probably not going to happen until Wii U sales start to pick up, which will probably be this holiday season. There are already dozens of people ready to buy a Wii U just for EarthBound, and Nintendo’s going to keep it available on the Wii U eShop exclusively until pretty much everyone that wants it owns it. Is there any Super Nintendo games on the 3DS, no. So they aren’t going to put it on there. 3DS VC=GBA games, Wii U=Super Nintendo games. If they give us Mother 3, it’ll be on the 3DS. On the 3DS, GBA VC games are only for ambassadors, they have no plans to sell them to everyone. On the Wii U they are announced to be released soon, for everyone. That’s the plan, as long as Iwata and his crew doesn’t change their mind. It’s interesting how NoA and NoE seem to handle these charts. In Eurpe the 30 Cent games don’t appear so high in the charts. They probably count them only after the sale. And Trine 2 is number 1 here. Even better, it’s actually number one in the Australian chart!!! It’s been #9 for a few weeks now. I bet it will take a while to reach #1 because my understanding is that all of the games it has to beat were the 30 cent ones. @Anonymous Actually, Super Mario World is pretty high up there despite not being offered for 30 cents.